Further references in the book indicate that “In Michelangelo’s statue of Moses, the horns depict anger.” (Ex. xxxii) although this definition has not been widely accepted as true and there’s still much debate among biblical scholars, it’s this angle Sigmund Freud takes in his essay entitled The Moses of Michelangelo, in which he seeks to understand the emotional impact Michelangelo’s statue has on its audience. “Here possibly is where the idea of horns originates. For in the Mystery language horns are the sign of the successful neophyte, of one who has passed the dread tests of initiation and quite literally touched divinity. But later, after the State had taken over the supervision of the Mystery schools, the spirit of their teachings became obscured so that the horn came to symbolize the conqueror of worlds rather than the conqueror of self. Thus Jamshid, builder of Persepolis, was called ‘the two-horned.’ And Alexander the Great, initiated by the oracle at the desert oasis Temple of Amon in 332 B.C., accepted as an inestimable honor the horned AKKADIAN CYLINDER SEAL headdress. He wore it with pride as did the ‘initiated’ of the Egyptians, Greeks, and Romans. To them, as to the Vikings, horns meant power of the spirit. So with the Celts who inscribed the likeness of their teacher, Cernunnos, ‘the horned,’ on a silver plaque, sitting in a Krishna pose and holding this emblem in the form of a ram-headed serpent in his hand. 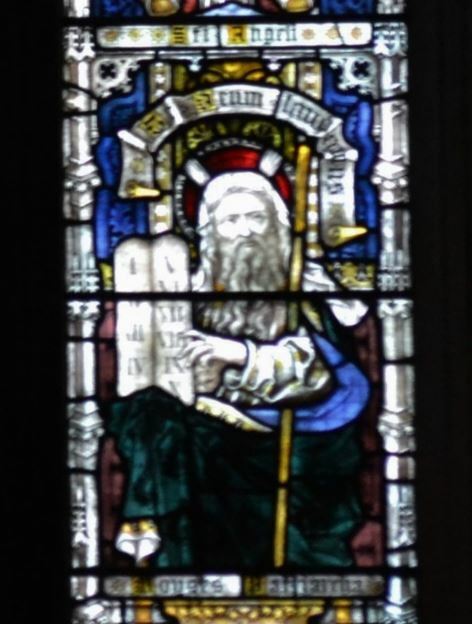 “Moses was without doubt accustomed to seeing ram-headed figures painted on the walls of the royal tombs, where they represented the Sun-God, Amon (later Amon-Ra). During the 6th and 7th centuries B.C. this deity was depicted in the likeness of a man, standing or seated as the Moses of Michelangelo, and frequently wearing the headmask of a ram. Those who interpret Egyptian belief explain that he symbolizes first, the Pleroma, the Fullness of things, and then, that creative force in nature which initiates and maintains intelligent life in this and in the lower worlds. For Amon-Ra was also presented enthroned on a solar boat journeying through the twelve hours of the night to illumine the Underworld. 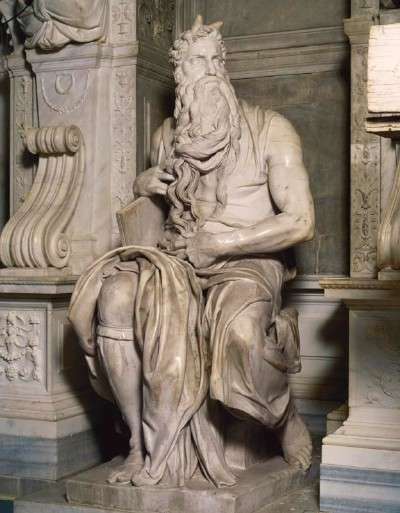 At this point I felt it might be time to take a closer look at Michelangelo’s depiction of Moses, particularly the feet. Don’t get me wrong, this could be my over active imagination in action because at first I never seen the hooves, even though I did feel the feet looked a little peculiar. Just as I was about to give up, I had one last glance still not quite believing Michelangelo hadn’t incorporated the hoofed feet into the piece, and then it hit me. Although the toes of the feet could clearly be seen, the pattern on the folds of what he’s wearing form the shape of a hoof. It’s like an optical illusion because once you see it, you can’t fail to see it, particularly on the foot on the left. As I look at the foot on the right I still feel this discovery may be due more to my imagination than actual fact but I’m definitely curious and would love to hear from those who have the chance to take a closer look at the statue in question. As always these ponderings have taken on a life of their own so I’m going to leave it here for now and maybe another day I’ll take a closer look at the AKKADIAN CYLINDER SEAL and the mysterious warriors in skirts.